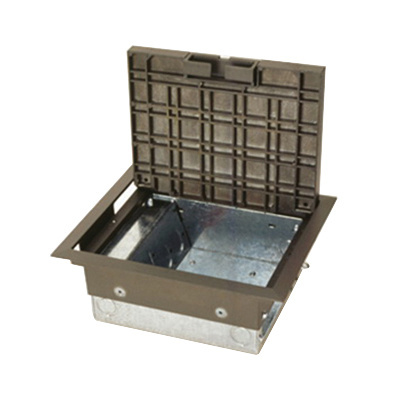 Wiremold 4-Gang dual service floor box features steel construction and die-cast zinc cover. Square floor box has a dimension of 8-Inch x 10-Inch x 4-Inch. It has a maximum capacity of 130.09 - 201.09-Cubic-Inch. This floor box features four 1/2 - 3/4-Inch power concentric knockouts and two 1/2 - 3/4-Inch communication concentric knockouts. It comes with one power plate, two duplex receptacle and two communication adapter device configuration. Floor box is RoHS compliant and meets NEC standards.